Born in Yaracuy, Venezuela on October 30, 1975, World Series champion Marco Scutaro. 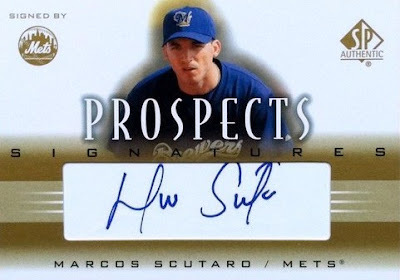 Like many good glove infield journeymen before him, this year's success follows ten years spent in a multitude of uniforms, cities, and hotels; even his Prospects card can't decide between the Brewers and Mets. Today's card shows Marco as a Brewer because he spent 2000-01 in their farm system, but names him as a Met, where he debuted as a big leaguer in 2002. Not sure how Upper Deck planned this release, as Scutaro's signature is just a white card under that windowed cut-out; collectors almost always want on-card signatures with photos that match the team. 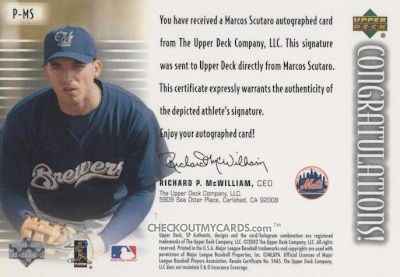 I suspect card makers anxious to get rookies on the market try to get autographs from everyone with a pro contract and put less concern into the set design itself. Scutaro's 14-for-28 hitting and solid fielding against St. Louis netted the 36 year-old his first hardware, the 2012 NLCS MVP, a nice shelf companion to the Giants championship ring. March's go-ahead knock in game 4 was the first World Series RBI in extra-innings by a Giants player since Dusty Rhodes in 1954, who won game 1 with a walk-off homer (box score). 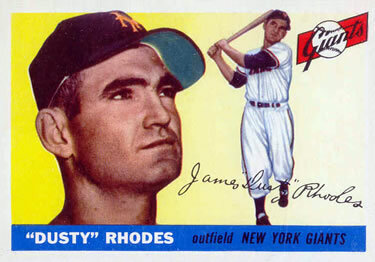 Topps honored his august accomplishment with their first card in 1955. Topps had good reason to salute Dusty, as they and the Giants were both still in New York. Putting a relocated team hero like Marco on 2013 card #1 is wishful thinking, but would make a nice birthday present. Congrats to San Francisco fans; the rest of us look forward to next spring!